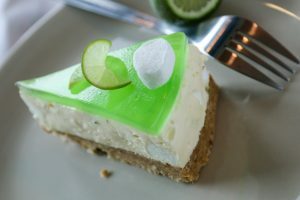 I decided to take a classic Key Lime Pie and give it a twist by making it into a Lime Cheesecake. 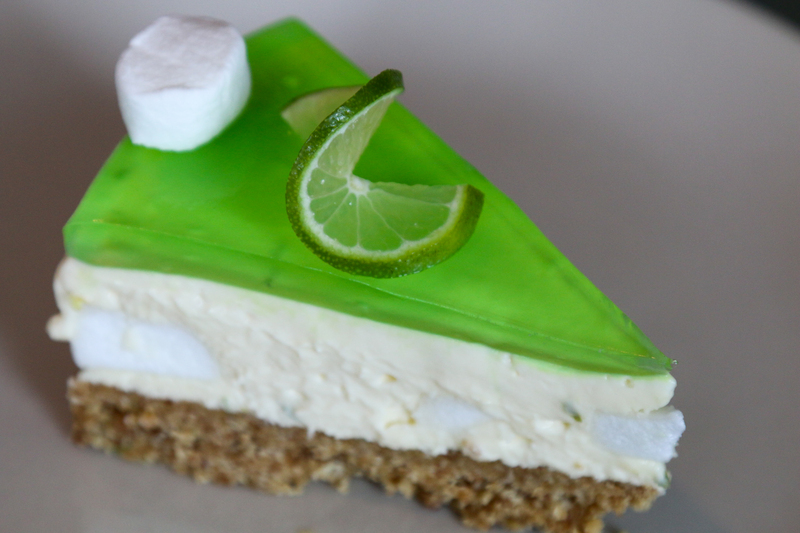 I love the Zesty Flavour of the lime and the soft marshmallows of the cheesecake filling. The fresh ginger in the biscuit base adds another dimension. If you decide to make this recipe don’t forget to share some pictures across to me on Facebook, Twitter, google + or whatever social media you like 🙂 I love to see what you have been up to. First you need to make the biscuit base. Melt the butter in a pan and add the flour, oat bran and sugar. Stir until the biscuit crumbs are a nice golden brown and then add the grated ginger and the lime zest. Add the melted butter and mix through and then pour into a spring form pan. Press down into the tin and make a smooth base. Place in the fridge to chill whilst you make the cheesecake filling. Place the cream cheese and the powdered sugar into a bowl and cream together until smooth and fluffy. Add the vanilla essence, lime juice and the lime and lemon zest and cream together until smooth. Whisk the cream until thick and then spoon into the cheese and sugar mixture and stir through. Cut the marshmallows into bite size pieces, add to the mixture and gently stir into the mixture. Place into the baking tin on top of the cookie base. Make the top as smooth as possible and pop the cheesecake into the fridge to firm up. Make up the lime jelly as directed on the packet and allow to cool but not set. Once the cheesecake is firm and the jelly cool, gently spoon the jelly over the top of the cheesecake. Place back into the fridge to allow the jelly to set. Once set remove from the fridge and decorate the top of the cheesecake with marshmallows. Cut a piece and serve with a slice of lime.